Never in my life did I think I would experience 11 military PCS moves in 15 years. As a young child I moved all the time and was eager for a life of settling down with my college sweetheart. But life would go a completely different way. The events of 9/11 changed the trajectory of our family’s lives forever. After 9/11 my husband felt compelled to join the U.S. Army and shortly after, he was off to boot camp. As a result of moving so many times over the years, I have learned a lot that has proven to be sage advice to other military spouses. 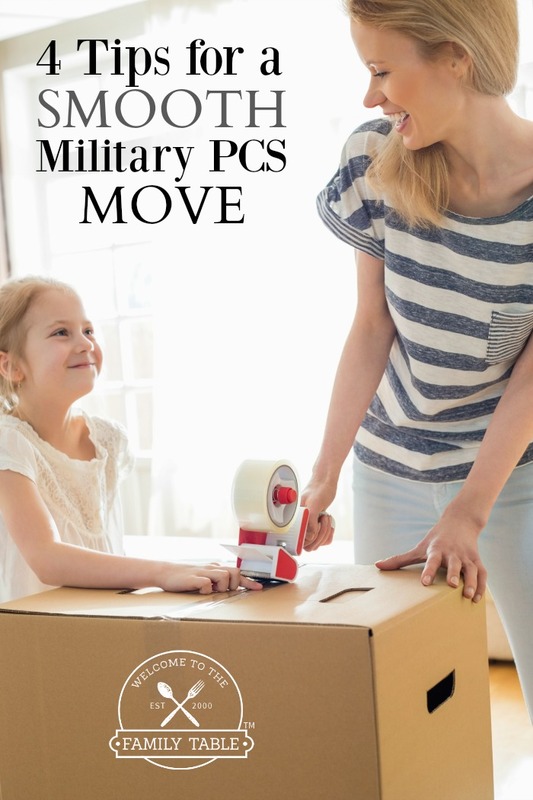 Whether you are experiencing your first military PCS move or your last, these tips can help you conquer the unnecessary stress these moves can bring. Today I am sharing 4 tips for a smooth military PCS move. Always Purge. Always. If I learned anything as a military spouse of 15 years, it is the importance of purging before a PCS move. Every new location means a new house that will likely be a different size. It is best to keep your personal belongings to a minimum so you are not left with a ton of stuff that won’t fit into the new house. Even if the new house is larger than the one before, you can always pick up a thing or two if needed. This eliminates the stress that clutter brings. Stay Organized. Another tip is to always remain organized. When your family receives important papers related to the move, always file them in a place that is safe that you won’t forget. We use an accordion file folder for all of our paperwork. We designated this as our PCS folder. Join FB Groups in Your New Location. One thing I always do is find groups on Facebook related to our new duty station. As a homeschooling family it has been a valuable way to connect with other families well ahead of time. It also gives us insight into the area, allowing us to ask specific questions from research we do online. Treat Your Movers Kindly. Over the last 15 years we have had a lot of movers in several states and countries. One thing is true about every mover we’ve encountered: If you take care of them, they’ll take care of you. While I know that items can be broken in a move (especially overseas) we have only had one broken item in 11 moves. We are certain it is because we are kind to our movers and always provide them with plenty of good food, water, and lots of laughter too. Looking for even more great tips? Check out the Spouses Guide to Surviving Military Relocation over on the CORT blog.